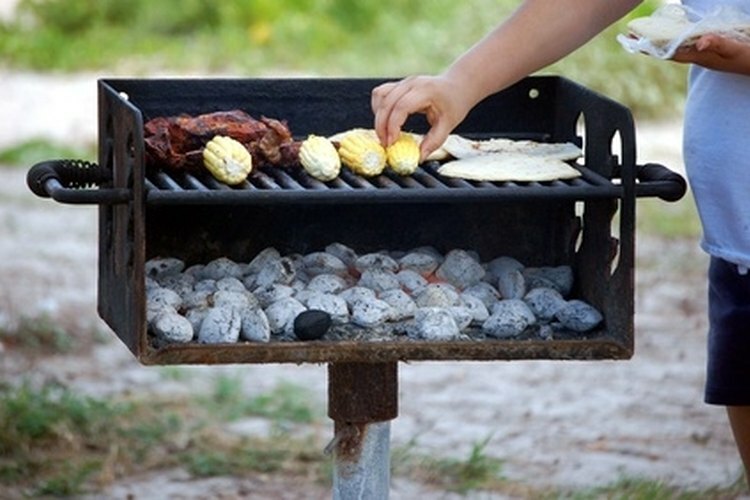 Cook your meal on a grill for easy clean up when camping out. Camping in a screened shelter is convenient for families with children who need easy access to the outdoors. Screened shelters allow campers an insect-free setting while still enjoying the fresh air. For older campers and toddlers, the firm concrete floor provides solid footing. Some Texas campgrounds have the table inside the shelter alongside a counter and sink, making the shelter like a cabin with open-air windows. Six screened cabanas sit in a row with attached walls. Each unit features a bunk bed, picnic table, counter, sink with cold running water and electricity. The bath house with showers and flush toilets is located closeby. Fort Travis added shutters to their cabanas to keep out unwanted rain or wind. Bring your air mattress, cook stove, cooler and children. Beach access, modern playground and open areas for a game of soccer or kickball make Fort Travis a good family destination. Reservations are suggested during the summer months. Secluded Caddo Lake offers campers a chance to get away from home and enjoy natural surroundings in a quiet setting. Seven screened shelters are nestled in the piney woods within walking distance of the 27,000 acre cypress swamp. The park updated one of the shelters to an air-conditioned unit with glass windows, porch and bunk beds. Enjoy nature walks along the bayous under cypress trees with branches of droopy Spanish moss. Shelters have a grill, table and faucet at each site. Eight screened shelters are situated lakeside in the shelter area, which is separate from the tent and recreational vehicle campground. A bath house with showers and flush toilets serves this area. The park has hiking trails, boat ramps and marina. Boat, swim and fish on Lake Belton, which is located on the Leon River in south central Texas with 136 miles of shoreline. Many Texas state parks have screened shelters for rent. Goliad State Park sits in the geographic heart of the historic fight for Texas independence. They offer five screened shelters with faucet, grill and picnic table at each site and a nearby playground and bath house with flush toilets and showers. The jewel of the park is the reconstructed replica of the 1749 Mission Espíritu Santo set along the banks of the San Antonio River. Take a hiking trail to adjacent the historical sites of General Ignacio Zaragoza's birthplace and a memorial plaza for Colonel James W. Fannin, Jr. and his troops, who surrendered to Mexican forces and were massacred. The park also hosts a museum and interpretive displays.